"Are you ready to risk your life for Ninjago?" Warner Bros has debuted the first full trailer for The LEGO Ninjago Movie, showing in front of The LEGO Batman Movie in theaters this weekend. This latest LEGO Movie from Warner Animation Group tells the story of six young ninjas who must defend their island home called Ninjago. Jackie Chan voices Sensei Wu, their master and teacher. The rest of the voice cast includes Olivia Munn, Dave Franco, Michael Peña, Abbi Jacobson, Zach Woods, Kumail Nanjiani, Fred Armisen, and Justin Theroux as the evil Garmadon. This actually looks quite fun, and if it's as good as the other two LEGO Movies, even better. The other exciting news - this will be out in theaters later this year. Six young ninjas Lloyd, Jay, Kai, Cole, Zane and Nya are tasked with defending their island home, called Ninjago. By night, they're gifted warriors, using their skills and awesome fleet of vehicles to fight villains and monsters. By day, they're ordinary teens struggling against their greatest enemy: high school. The LEGO Ninjago Movie is co-directed by Charlie Bean ("TRON: Uprising", "Robotboy"), Paul Fisher and Bob Logan (Meatballs 4). The screenplay is written by Hilary Winston, Bob Logan and Paul Fisher. The movie is made and animated by Warner Animation Group (also called "WAG") based in Burbank. 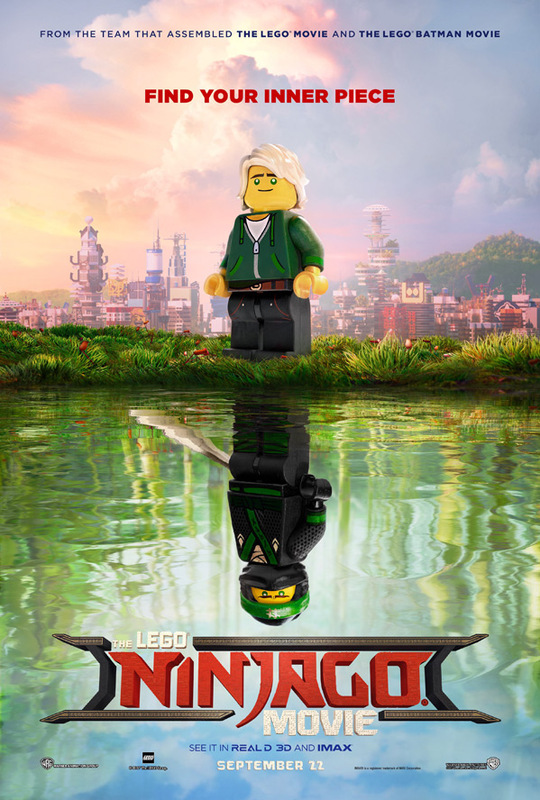 Warner Bros will release The LEGO Ninjago Movie in theaters starting September 22nd later this fall. Who's in? Apparently LEGO is cranking out movies for all their toylines now huh? Doesn't have the same charm as BATMAN or The LEGO movie for me. I think it had a lot of charm and looks great. That bit with LaLoyd whispering dad was pretty funny. This film was announced back in 2013, a year before the original Lego movie was released whereas Lego Batman wasn't announced until after the success of the character in the original film. I'm looking forward to taking my son on Friday to see Lego Batman. These have serious potential to become tired and boring real fast, but I'll be damned if they don't seem to be striking the perfect balance of being childish and adult. Bit disaaponited tbh. Not following on, or even a part of the tv series, so can't really be sold to the kids that follow it. My boy will hate it. I was hoping they would of kept the style of the series tbh, its a bit more serious and yet still fun. I gather all Lego movies will follow the same format now, which is a pity.